I purchased a pair of these tires after getting sick of the whole 28c smallness that I was riding on before. Once I got a pair of Ribmos in 32c, everything was better. After installing them and having the weight of the bike change pretty noticeably, I was sort of worried that I made a poor decision on tire choices. After riding them for about a week, everything was back to normal though, all by general tricks were locked again. These bad boys grip like no other tire that I have ever ridden, allowing you to shred on almost any surface imaginable. They are super grippy at first which sort of forces you to battle with certain slide/skid combos, but after a phew weeks, these babies are perfect. The Ribmos are super thick too, supposedly some of the thickest on the market, and that is why they add a little weight to your ride. You ignore the added weight though, after you find out that the skid life of this tire is ridiculously long, as well as the strength of them to resist pinch flats. I rode 23-28c tubes in these for a while before i even got the first pinchy. The tires are so thick, they sit tall, allowing you to do bigger gaps and things of that nature, while the tires just make out with the impact. 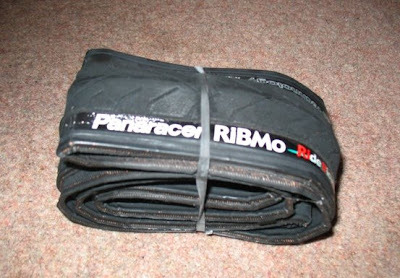 The thick rubber is of course designed to fight off punctures and such, which is an added plus. I rode a size 32c, but after comparing them to a phew other 35c tires, Ribmos run big, which means 32c tires are actually 35s. Its sick. The only problem that I had with these is the fact that they are foldable. Because of this, the walls are fairly week, and although I rode my first pair for over 2 months, the rear finally gave out on me, and could no longer stand the abuse that i was putting it under. You would be surprised at how much the side of your tires slap, scrape, grind on foreign objects, therefore killing the sidewall life. Overall, these tires are sick, and as you can see in the above photo, they make your ride sit up like a Tonka monster truck. I will definitely be snagging another pair of these eventually. Gnarly.